You are a football fan and probably have watched hundreds of science fiction movies containaing robots and cyborgs, but ever thought that soon, this will turn out to be reality? 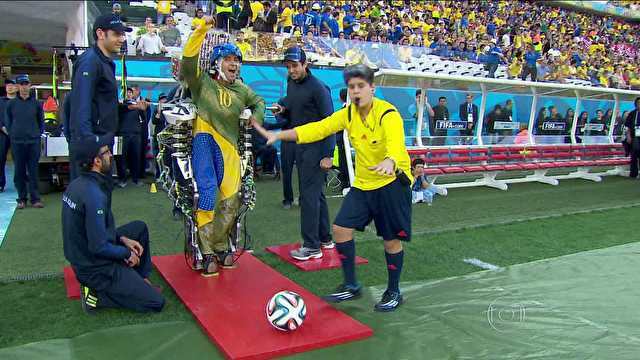 A paraplegic man will stand up from his wheelchair, make the first kick of the FIFA World Cup 2014 in Brazil? If you have not thought it yet, you’re wrong. Check this video, in case you have missed. This is what happened when neuroscience and football got connected in the World Cup and I think it is an inspiration to many people, that we can do extra ordinary things, no matter what kind of problem we face. It is the dream project of Miguel Nicolelis, a Brazilian neuroscientist at the Duke University. “We want to galvanize people’s imaginations,” says Miguel. “With enough political will and investment, we could make wheelchairs obsolete.” Nicolelis is a pioneer in the field. In the 1990s, he helped build the first mind-controlled arm. Rats learned that they could manipulate the device to get a drink of water simply by thinking about doing so and now, they go ahead, beyond the level what most people can’t even think about. In that project, an electronic chip was embedded in the part of each rodent’s brain that controls voluntary muscle movements. The wires stuck out from the chip like bristles on a brush picked up electrical impulses generated by brain cells and relayed those signals to a computer. Researchers studied the signals as the rats pushed a lever to guide the arm that gave them water, and they saw groups of neurons firing at different rates as the rats moved the lever in different directions. An algorithm was developed to decipher the patterns, discern the animal’s intention at any given moment and send commands from the brain directly to the arm instead of to the lever. Eventually, rats could move the arm without pushing the lever at all. Using a method quite similar to this, in 2000, they put an owl monkey to the test which was connected to the Internet and had controlled an arm located 600 miles away. And the monkey that was able to dictate the pace of a robot jogging on a treadmill half a world away in Japan, in 2008. One of the first human beings to participate in the test was Matt Nagle, who lost the use of his extremities after being stabbed in the spine. With the aid of electrodes placed in his brain at Brown University in 2004, he learned to raise, lower and drop a piece of hard candy using a primitive jointed arm not connected to his body. The same thing was applied to 29 year old, Juliano Pinto in case of him, they decided to work on the lower part of the body. Pinto just had to think about standing up and walking to the ball and then, kick it, the signals from his brains were analysed in computer and was relayed back to the robotic parts which consist of many parts and hydraulic systems, which helped him move his leg. And the best part, about the system is that, the whole;e environment was designed so that whenever he stands up, walk or kick the ball, the movements will be mapped and the sensation will also be relayed back to his brain, so that he does not feel like his leg is being controlled by someone else or he’s like a robot. He could sense everything he is doing and he successfully made the first kick of the FIFA World Cup 2014, and after the kick it looks like he was overjoyed with the excitement of moving his leg again and kicking the ball in-front of thousands of people and sport-stars. This was something different we saw in this World Cup, though we are still far from developing a cyborg, but we can guarantee that the journey won’t be very long. Whatever you’ve watched in movies or games are soon turning up to a reality.